Mauricio Seguel, a veterinarian at the University of Georgia, has studied a colony of fur seals on Guafo Island since 2005, when he was a student in Chile. An “active and feisty” young sea lion that lost its way is cruising toward a feeding regimen aimed to help it recover after it twice visited grounds at the Oakland International Airport on Thursday. A California sea lion tracked since its birth seven years ago was recently found dead with several gunshot wounds on a Point Reyes National Seashore beach, the national park reported Friday. It is one of hundreds of gunshot cases that have been documented by local marine mammal rescue officials over the years. Sea lions sick with leptospirosis have been showing up on California beaches in near record numbers, the Marine Mammal Center reports. As a result, staff and volunteers at the center have been busy in a normally quiet time of the year. A crowd of onlookers at Rodeo Beach on Thursday watched eagerly as a pair of healthy sea lions wiggled out of their cages, flopped along the sand and dove into the sea, returning to the wild. Sole, a malnourished monk seal pup rescued from Kalaupapa over the summer, has successfully been released back to the ocean at Molokai after being rehabilitated at Ke Kai Ola, according to The Marine Mammal Center. A BOLO — be on the lookout — has been issued for Hawaiian monk seal Manu‘iwa as officials at Ke Kai Ola try to track down the weaner who in recent days has been spotted with a hook in her lip. More than 220 California sea lions, 73 from Monterey County, have been hit by a kidney infection that can be fatal in the second most severe outbreak in recorded history. With whale entanglements on the rise off the Southern California coast, it is no surprise that California sea lions are increasingly being trapped in lines and nets as well. Hundreds of California sea lions have been stricken by an often deadly bacterial infection and are washing ashore daily up and down the coast, raising fears among biologists that an already soaring death toll could continue to rise. Veterinarian and seal expert Claire Simeone was just about to settle down and enjoy her lunch when her cellphone rang. Work was calling, and as director of the Marine Mammal Center’s Ke Kai Ola Hawaiian Monk Seal Hospital in Kailua-Kona, Hawaii, Simeone picked up immediately. Head over the Golden Gate Bridge to Sausalito where you can meet the marine mammals who are receiving treatment at the Marine Mammal Center. When normally harmless algae found off the West Coast make a deadly neurotoxin called domoic acid, casualties rocket up the food chain. Even though it was banned decades ago, one of the more dangerous industrial pollutants of the last century is wreaking havoc on killer whale populations worldwide. On Sept. 16, the Pacific Marine Mammal Center released a group of four sea lions back into the ocean. It’s something the Laguna Beach facility does regularly, but this time the release raised some questions from onlookers. Facebook birthday fundraisers: worthwhile or annoying? Happy birthday to me! Can you donate to my pet cause? Such is the pitch these days of amateur fundraisers, who are using social media to prod their contacts for money. Every morning keepers at Chicago’s Shedd Aquarium shake rattles and blow whistles to let Cruz—a 225-pound sea lion—know it’s time for breakfast. He’s blind, so his keepers rely on sound, touch, and scent to guide him around his enclosure. A Hawaiian monk seal pup recently rescued on Kauai is in stable condition at Ke Kai Ola monk seal hospital. The male pup, RK58, was born on July 16 to monk seal RH58 (Rocky) and was involved in a switch with another mom-pup pair on the same remote Kauai beach, said Dr. Claire Simeone, hospital director at The Marine Mammal Center’s Ke Kai Ola Hawaiian monk seal hospital in Kailua-Kona. The Marine Mammal Center rescued a sea lion at Olde Port Beach in Avila Beach Sunday. The center got the report and arrived to Avila Beach around 11:30 a.m. Operations Manager Diana Kramer said when they got there they saw the sea lion was entangled in what appeared to be a packing strap and was extremely underweight. The center’s rescue team was able to capture both sea otters and began the process of getting care for the pair, but Langly’s mother died on the trip. There’s a crisis going on in the Pacific Ocean as an innocent porpoise falls prey to money and greed. It’s a marine mammal known as the Senorita of the sea or the Panda of the ocean, because of the big rings around its eyes. The Marine Mammal Center in Sausalito wants the public's help to name an otter pup that had a particularly rough start to life. A malnourished Hawaiian monk seal pup from Molokai is now being cared for at Ke Kai Ola, a hospital for the endangered seals in Kona, according to The Marine Mammal Center, which runs the facility. Langly is not like “all the otters.” The little-sea-mammal-who-could has triumphed over tragedy and is now growing stronger by the day and enjoying life from “the otter side” of heartbreak thanks to the efforts of Marin County, California’s Marine Mammal Center. Continuing its efforts for social good -- and helping to get back into good graces with its users -- the social network said on Tuesday it will donate $5 to every newly created fundraiser posted on a US user's birthday. Raptor, a sea lion found with fish hooks embedded in her mouth, is healing after sedation and surgery at the Pacific Marine Mammal Center. As the sun crept above the horizon, CBS News' Don Dahler headed out in the Gulf of California with a disparate group of volunteers, veterinarians and marine biologists on a difficult -- some would say impossible -- mission to track the rarest of marine mammals: the vaquita, a species of porpoise. It's a mission two years in the making. Raptor, a sea lion found with fish hooks embedded in her mouth, is healing after sedation and surgery at the Pacific Marine Mammal Center. The yearling was found by Huntington Beach city lifeguards on the sand near the Huntington Beach Pier on June 13. A blue whale found Monday on a beach at Point Reyes National Seashore died of blunt force trauma consistent with being hit by a ship, scientists with The Marine Mammal Center said Wednesday. Almost a year to the day since a spectacular 79-foot blue whale washed up on Agate Beach, a 58-foot fin whale wound up on nearby Brighton Beach after meeting the same fate: death by ship strike. What if you encounter injured baby wildlife? Summer is upon us, which means wild animals are caring for their newly arrived offspring, and humans are planning hikes and other ventures out into the wilderness. Because busy animal parents sometimes need to leave their charges, this is the time of year when humans are most likely to encounter babies of the animal kingdom. There’s no one way to describe the scent of a beached, rotting whale. See, it really depends on time and space: So long as you’re more than 20 feet away, you don’t smell a thing. But if you’re downwind, the sour stench will just about bowl you over. Human interaction with young sea mammals on Marin and other state beaches is a problem each year, and Marine Mammal Center officials are now reminding people to stay away from the pups. A massive gray whale that was found near the Bay Bridge in San Francisco was likely killed by blunt force trauma from a ship, according to necropsy results from the Marine Mammal Center in California. The moment I laid eyes on the sea lion Wednesday afternoon, I knew something wasn’t right. His ribs, which should be hidden beneath a thick layer of blubber, were jutting out beneath his cigar colored coat. A small enzyme could be the solution to plastic pollution, one of the planet’s biggest environmental problems. Crowds of pinnipeds are returning to their rookeries on California beaches this time of year to give birth to their pups. The most common of those pinnipeds right now -- from San Luis Obispo northward – are Pacific harbor seals and northern elephant seals. Monk seal pup Manu‘iwa is on her own. Now more than ever it is imperative Hawaii Island residents and visitors alike work to keep this young, very curious seal wild as Manu’iwa is the only pup on Hawaii Island and has just four other seals with whom to interact, officials stressed Monday. Ever wonder who takes care of the seals, sea lions, and other marine mammals that end up stranded on California's coast? 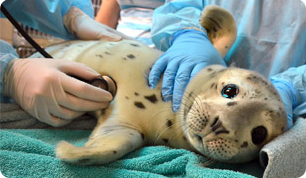 Marin's Marine Mammal Center has been on the scene rescuing and caring for sick, injured, malnourished, and abandoned marine mammals—including elephant seals, sea lions, harbor seals, sea otters, and even whales—since 1975. While the spring attracts more people to local beaches, marine mammals are also coming onshore for pupping season. The Marine Mammal Center is worried people aren’t giving the animals their space. A fuzzy blur of brown in an expanse of murky water sends most nature lovers' hearts aflutter, but it's a sight rarely seen over the last century in Northern California. Where once there were next-to-no southern sea otters in California waters – fur traders hunted them to near-extinction in the 19th century – now there are some. They aren't hard to find if you know where to look. It's seal pupping season in Northern California, which means the pudgy mammals will be sunning themselves on the region's beaches. They're cute, indeed, but if you see one, let it be. And most certainly don't snap a selfie. Forging a path to a fulfilling career usually takes time, but occasionally, a childhood passion provides the inspiration. Claire Simeone was that kid. For as far back as she can remember, she was always taking care of the animals around her neighborhood. Today her neighborhood happens to be the Pacific Ocean. A 28-foot juvenile male gray whale that washed up on a remote Angel Island beach likely died of malnutrition, according to the Marine Mammal Center. The monarchs start arriving around September, the humpback whales in May and the harbor seals, along with their relatives the elephant seals, around April. Why Did San Francisco’s Sea Lions Suddenly Start Attacking Swimmers? The sun was setting on Tuesday, December 12, as Anders Jakobsson started his usual swim in San Francisco’s Aquatic Park cove. As the 50-year-old’s body began to warm up in the cold water, he felt something clamp down on his right foot. Over the next few weeks, marine biologists say more elephant seal pups, harbor seal pups, and sea lion pups will start showing up along the shores of San Luis Obispo County. It's an exciting time to see the animals, but wildlife specialists are urging people to keep their distance. Dr. Claire Simeone’s normal habitat is at Sausalito’s Marine Mammal Center, where she is a conservation medicine veterinarian working at the intersection of marine mammal and human health. Just a few decades ago, the California sea lion seemed on the verge of becoming an endangered species. It was 1964, and hunting and fishing had caused the breeding population off the West Coast to shrink to just 35,000. The Marine Mammal Center is keeping an eye on a lethargic California sea lion this afternoon in the waters near San Francisco's Aquatic Park. The center, which is based in the Marin Headlands, sent a responder out to monitor the situation after it was called in by a member of the public around 9:30 a.m. If you've ever wanted to get up close and personal with baby seals and sea lions, now's your chance. Over the coming months, as seals and sea lions haul out on beaches and give birth to pups up and down the California coast, the Marine Mammal Center is looking for volunteers to care for a likely onslaught of young animals that need help. The Marine Mammal Center has named veterinarian Claire Simeone as the new director of Ke Kai Ola, the hospital for Hawaiian monk seals in Kailua-Kona. Nearly 5 million gallons of sewage spilled into the ocean on California's Central Coast after a filter at a water treatment plant got clogged and the computer system failed to sound an alarm, an official said Monday, forcing several popular beaches to close. A new study shows that the sea lions that have become so ubiquitous at Fisherman’s Wharf in San Francisco are thriving everywhere, with the sea mammals numbers tripling in recent years. The first veterinarian to become a TED Fellow is a Sausalito resident who works at the Marine Mammal Center, where she has helped others from around the world better understand caring for sea life. A recent rash of sea lion attacks along the San Francisco Bay have prompted concerns for swimmers who frequent the chilly waters.